In the future, our wallets will be technological forces - oh, well then the future is here. 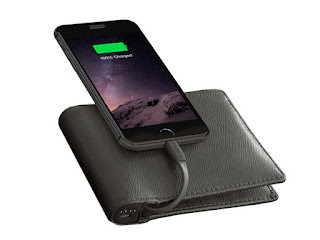 From Nomad Leather, this minimalist leather wallet looks like a basic, stylish bi-fold wallet, but it's also armed with a high-powered, 2400mAh battery designed to give your iPhone a full boost through its integrated Lightning cable. It does everything you want a wallet to do, plus gives you a spare battery. That is a practical invention.